Villa Park Stadium Tour & Sunday Lunch - £25.95 or £12.95 for weekday tour only. Kids £7.95/£13.95, Family £37.50/£71.50. Thought I'd post this after reading the deal for the Newcastle United Sports Direct Arena @ St. James' Park Stadium Tour with lunch for £75.00! Weekday Stadium Tours are just £12.95, Kids £7.95, Family £37.50 and Sunday Stadium Tours with Lunch are just £25.95, Kids £13.95, Family £71.50. Now I know this is going to be primarily of interest to Villa fans but the restaurants at Villa Park are award winning and Villa Park is a famous venue in the history of football. 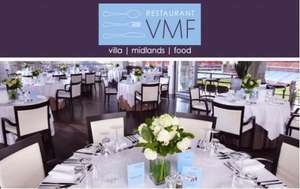 "A totally unique dining experience - enjoy award-winning food with spectacular views of the Villa Park pitch. Set in the luxurious surroundings of the Directors suite, relax in Restaurant VMF and sample our delicious menu, offering locally-sourced dishes cooked and served by our VMF apprentices. Click here for the VMF Story so far." "Villa Park is one of the oldest and most famous stadiums in Europe. Opened in 1897, it has hosted World Cup, European Championship and other international football matches as well as more FA Cup semi-finals than any other venue. The stadium was also the venue for the last ever European Cup Winners Cup final between Lazio and Real Mallorca in 1999. This famous venue is also one of a very select few that has hosted international matches over three different centuries, the first senior international taking place in 1899. Villa Park hosted 3 matches during the 1966 World Cup. And it’s not just football that has graced the club’s spiritual home. Villa Park has also been the setting for music concerts, featuring the likes of Bruce Springsteen, Barry White and Duran Duran. Even the famous evangelist Billy Graham addressed the masses at Villa Park. It truly is a blessed stadium"
It seems a good deal and the restaurant has a great reputation - can't believe they are charging £75 for Newcastle United's ground. They are actually charging for this? I think all clubs that offer it are charging for Sunday Lunch!